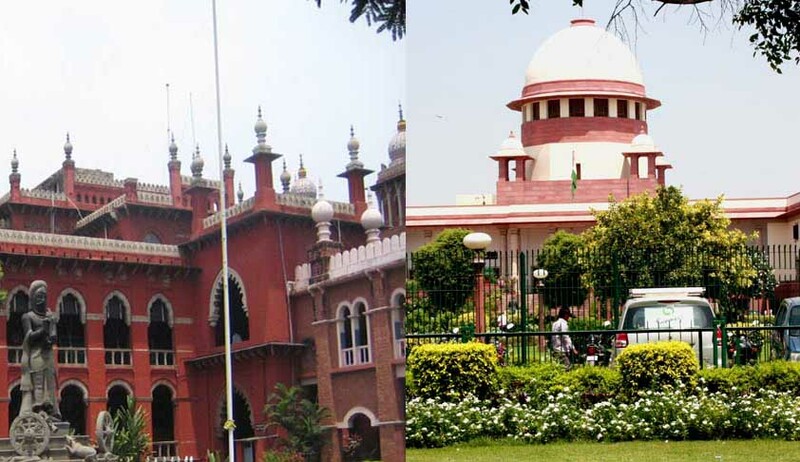 The constitutionality of the Search Committee (Constitution, terms and conditions of appointment of members and the manner of selection of panel of names for appointment of chairperson and members of Lokpal) Rules, 2014 has come under challenge in two separate Public Interest Litigations-one before the Supreme Court and the other, before the Madurai bench of the Madras High Court. In the one filed before the Supreme Court, Common Cause, a NGO, has questioned the entire selection process for appointment of chairperson and members of the Lokpal and sought for a stay of the same pending disposal of the petition. The plea of the NGO Common Cause, filed through Advocate Prashant Bhushan, is for a declaration from the Apex Court declaring as "illegal" the Search Committee (Constitution, Terms and Conditions of appointment of members and the manner of selection of Panel of names for appointment of Chairperson and Members of Lokpal) Rules, 2014 framed under the Lokpal and Lokayuktas Act, 2014. The petitioner also seeks a declaration that certain provisions of the Rules are ultra vires of the Lokpal and Lokayuktas Act and also sought quashing of the entire selection process initiated under the rules alleging that it is "illegal, arbitrary" and violative of Article 14 of the Constitution. It said that the government is going ahead with the selection process despite there being serious flaws in the rules under which selections are being done. "Justice K T Thomas and Fali Nariman, who were offered the post of the chairman and member of the Search Committee respectively, have already declined to accept the offers on these very grounds," the petition said. It also said that Rule 10 (1) provides that the Search Committee shall prepare a panel of persons to be considered by the Selection Committee for appointment of chairperson and members of the Lokpal, from among the list of persons provided by the central government, "directly runs counter to the very object of having an independent Lokpal and the provisions of the said Act". The petitioner further says, "Therefore, if the selection process of the Lokpal is not stayed during the pendency of the present writ petition, it would be rendered infructuous and public interest would suffer,"
In the Public Interest Litigation filed before the Madurai Bench of the Madras High Court earlier this week, a Madurai- based Lawyer G R Swaminathan, the petitioner has challenged the Search Committee (constitution, terms and conditions of appointment of members and the manner of selection of panel of names for appointment of chairperson and members of Lokpal) Rules, 2014 on the ground that it is contrary to the provisions of the Lokpal and Lokayuktas Act, 2014 and ultra vires Article 14 of the Constitution of India. The petitioner has further sought a ban on the search committee to recommend the panel of names to the selection committee to select a Lokpal and its members. When the petition came up before the Division Bench of Justices V Ramasubramanian and V M Velumani on Tuesday, the petitioner appeared as party-in-person and explained the case to the bench. The selection committee comprising the Prime Minister Manmohan Singh, Lok Sabha speaker Meira Kumar, the Supreme Court judge H L Dattu who is the nominee of the Chief Justice of India P Sathasivam, leader of the Opposition in the Lok Sabha Sushma Swaraj and jurist P P Rao reportedly met on February 20 and unanimously appointed retired justice K T Thomas as the chairperson of the search committee and appointed its members. Admittedly, till January 17, the four members of the selection committee had not met. The search committee rules have thus been framed even though the selection committee had not even been constituted on January 17, the petitioner said. The power of framing the rules and regulations can be done only with the approval of the selection committee under Section 4(4) of the Act. In this background, the whole process of framing the search committee rules and inviting application by the ministry is contrary to the provisions of the Act and liable to set aside. He further said that the rules have contained various unwanted things including classifying the applicants, seeking recommendation letter from eminent people associated with vigilance and anti-corruption etc, which were not actually told the in the Act. Rule 10(4) of the search committee rules is contrary to and ultra vires the provisions of Section 3(3)(b) and 3(4) of the Act. Under Section 3(3) of the Act, people of outstanding ability from different fields are eligible to be appointed as non-judicial members. But Rule 10 stipulates that only those who have held the post of secretary to the central and state governments are eligible to become members of the Lokpal and as per another rule, only those holding the post of chairman, managing director or CEO of a public sector undertaking can be eligible to become non-judicial members of the Lokpal. The Petitioner further said that there are no guidelines as to the basis on which the selection committee will select one out of the five names recommended for the post of chairperson of the Lokpal and eight of 24 names recommended for the post of members of the Lokpal. "In fact, it is mandatory for the selection committee to frame guidelines before search committee rules can be framed," he said. Thereafter, the Bench directed the Central Government to get instructions in the matter and adjourned the case.